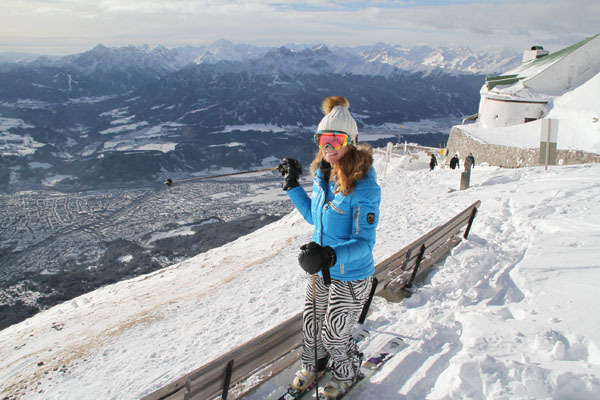 Innsbruck is a great base for a family ski trip in the Austrian Alps. 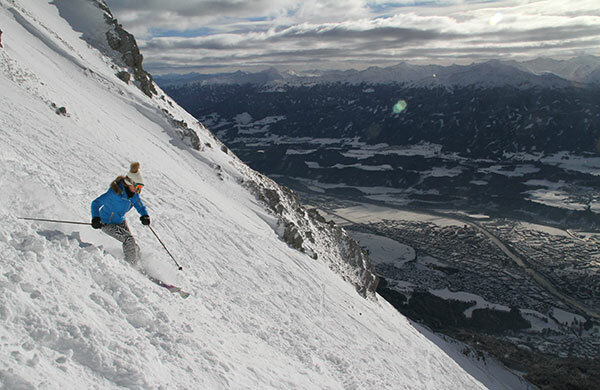 Home to two Winter Olympics 1964 and ‘76, Innsbruck has 9 ski resorts surrounding the Capital City of the Alps. Innsbruck’s nearby skiing combined is over 300 kilometers with 90 lifts, part of the Olympia Ski World ski pass – all on one ticket. So you can ski any of these by day, just a half-hour drive away typically, and explore the 850-year-old baroque and gothic city for family après ski. Call it urban skiing, or Olympic exploring. You have high alpine terrain, 9 ski areas, including the highest – Stubaier Glacier, the nearest – Nordkette, the most kid friendly – Kühtai, the alpine race venue –Axamer Lizum, plus Patscherkofel, Glungezer, Mutteralm, Schlick 2000, and Rangger Kopfl. Innsbruck means bridge over the River Inn, this glacial colored Inn River glides through town from its headwaters in the Swiss Alps. From the pedestrian square Maria Theresien you can see the steep slopes of Nordkette, the Bergisel Olympic Nordic Ski Jump and the peaks of surroudning ski areas as well. Staying in Innsbruck, the Hotel Innsbruck is a well-situated four star hotel on the river, with mountain views of the skiing at Nordkette, a lower floor swimming pool for the family, and a top floor adult spa. 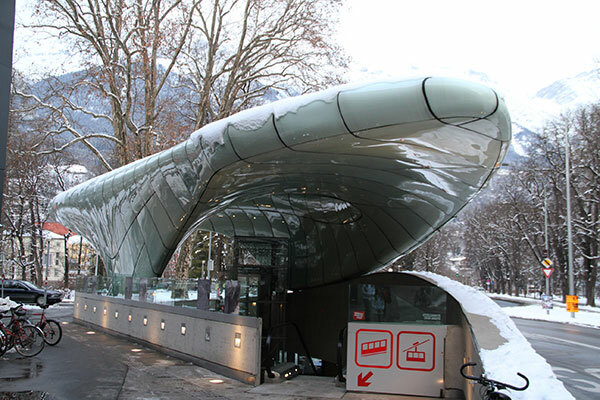 You are just steps to Innsbruck’s old village and a free ski shuttle away from 9 of the Olympia Ski World ski areas. 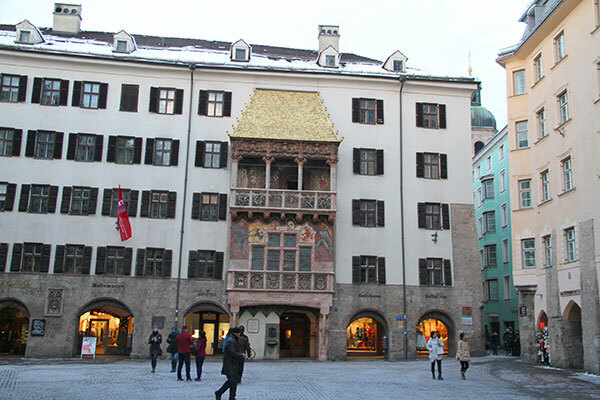 Amazing sights in Innsbruck include Austrian Emperor Maximillian’s tomb in Court Church, the Golden Roof, Swarovski’s Flagship store and the historic cobblestone streets that wind through this medieval mountain town, now a popular college city. Kühtai is the best family ski resort near Innsbruck. This high alpine resort has spectacular Alps views and multiple aspects from Austria’s highest alpine base village at 2,020 meters or 6,627. Kühtai offers families modern lifts, ego pleasing low angle terrain, and typically good snow. Kuhtai is perfect for families with just enough hotels at the base, and kids ski schools. Kühtai also shares a lift ticket with nearby Hochotz which is in the Otztal Valley, a 20 minute free shuttle down a beautiful snow canyon to Ochsengarten – the ski resort is a bit aged, especially the old gondola, but for adventurers there is great pistes plus tons of off-piste. You could easily spend a week skiing Kühtai with young kids, for a relaxing and super scenic Austria ski holiday. Nordkette is Innsbruck’s most convenient ski area, the ski funicular starts downtown Innsbruck, connecting to two more cable cars to reach the top at 7,400 feet. Nordkette is called the Jewel of the Alps, as its ski slopes sparkle above Innsbruck, especially during night skiing looking down at the palaces and church steeples. Nordkette is also incredibly steep extreme alpine terrain at the summit. Many just ride the Hafelekar to see Austria’s largest nature park, for sightseeing not skiing, which accounts for 85% of the lift riders. There is also an Alpin Zoo and an Igloo, Austria’s largest igloo at Seegrube each winter. Aside from the few groomed runs, terrain park and learn to ski area at Seegrube mid-mountain, Nordkette is an extreme skiers’ paradise, not so family friendly. Stubaier Glacier, in German – Stubaier Gletscher, is the highest ski resort in the Tyrol, 45-minutes from Innsbruck. Stubaier is Austria’s biggest glacier skiing with 25 lifts and over 110 kilometers of prepared ski runs, with a long ski season – October to June. Two gondolas bring you up to high alpine, highly scenic terrain, 10,000’ where you can see nine 3,000 meter peaks – Italy – Austria – Switzerland. Because Stubaier is big elevation it can be windy and wild, but the views and the 4,500’ vertical are worth it, it’s a long 6 mile ski down to the gleaming gondola building at the base. Stubaier is called the Kingdom of Snow because of its glaciers and significant snowmaking, there is even a summit Fun Park, and plenty of off-piste which can be tricky, dangerous and crevasse filled – this is glacier skiing after all. The highest restaurant in Austria, the Jochdohl is a modern summit building with panoramic window tables and cafeteria food. Stubaier Glacier is a cool – literally – ski day for high alpine adventure, with a few dozen prepared pistes up on the summit plateaus, and a family park, but it doesn’t’ have the cozy feeling of other authentic Austrian alpine ski resorts. Axamer Lizum is a half hour from Innsbruck, up a wild winding mountain road. Axamer Lizum is famed for hosting the Winter Olympics 1964 and 1976, and you can ski the Women’s Downhill and Slalom runs. Otherwise there’s a dozen prepared ski runs on two peaks. At the base are two ski in ski out hotels and an après ski bar. The Olympiabahn funicular – a cool old lift takes you the most spectacular Panoramic Hoadl Haus Lodge at Azamer Lizum’s 7,677’ summit – with the largest deck in Austria offering stellar 360 views to Innsbruck from inside the glass lodge as well. Azamer Lizum is a fun family ski day on a crystal clear day. A family ski week in Innsbruck, you should ski the Stubai Glacier and the beautiful ski slopes of Kühtai, and explore the city and more ski resorts. Innsbruck airport is located right in the city, or Munich is two hours away. You can also visit nearby ski resorts in Austria’s Zillertal Valley.